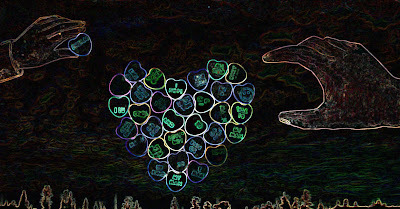 Here is the same image manipulated with filters in photoshop. and here again manipulated using Glowing Edge filter. 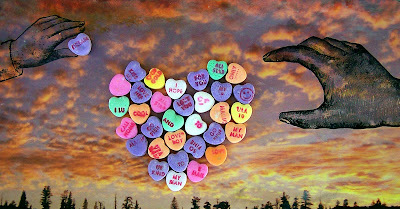 As I mentioned in earlier comments, I am not one for the "V" day hoopla, nor all the commercialism that follows this holiday, but I am nostalgic about hearts cut from paper, paper laced doillies and the old timey candy hearts from Necco. I loved receiving these as a child and I love receiving them as an adult. When I arrived at work on Thursday, I was greeted by a box of these Necco Sweetheart candies and a cut paper heart with a lovely handwritten sentiment on the back, "Happy V Day" from Gracie. Imagine my delight. Unfortunately these sayings aren't stamped as clear and sharp as they were a long time ago but the sentiment and feelings are the same. I don't even like to eat these candies, they just make me smile, so I thought best to memorialize them in a collage. I leave you my sweet hearts and thanks for stopping by! 1847! Wow! I never knew that the company was that old. I am learning a lot from you. Thanks..and sweet candy hearts too. I love how different the piece looks with the filters!! your candy hearts look great! 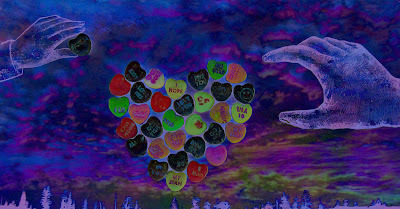 I am, as you, not in love with eating those cute little candy hearts, but I love to get them and read them and leave little candy heart "notes" everywhere!! I loved eating those candies when I was a kid and didn't mind that they didn't taste all that great. I loved what they had printed on them, yes, they were even exported to Europe. I think we didn't just eat them at valentine's day, I think we ate them the rest of the year too, but that is a very vague memory. Do any of you remember Bazooka gum with the cartoon inside? It was a big piece of pink chewing gum that we made last forever, until it had lost all its flavor and was just a sticky mess. Like you, I have a soft place in my heart for cut paper hearts, and Necco candies. They were an important part of my childhood too. Like Peeps. Can't wait to see what you do with those! These are all beautiful. I have been here twice today, looking at them over and over, but I can't decide which is my favorite. I do love the blue one a lot, but each is so well done and has its own particular quality. They truly qualify as eye candy!